Knitting socks is one of the most popular knitting pastimes, but once you've knit and worn your socks, what's the best way to wash them to keep them in good shape for the long-term? The answer depends on the fiber content of your socks and how particular you want to be. The first step to properly washing hand knit socks is to determine the fiber content and whether the yarn is machine washable. If you knit the socks yourself that should be pretty easy; just consult the ball band. If you didn't knit the socks yourself, can't remember the fiber content or otherwise aren't sure what the socks are made of, do not wash them in the washing machine. There are a lot of potential mishaps that can happen when laundering unknown fibers in the washing machine, from felting of animal fibers to melting acrylics washed or dried in a too-hot machine. Even with sock yarns that are machine washable, it's best to wash your hand knit socks in cold water on a short cycle. Throw them in with dark clothes. And even if the yarn's ball band says that the yarn is machine dryable, never put hand knit socks in the dryer. There's too much potential for stretching, shrinking or other unpleasantness. Just lay them flat or throw them over the shower curtain rod to dry. 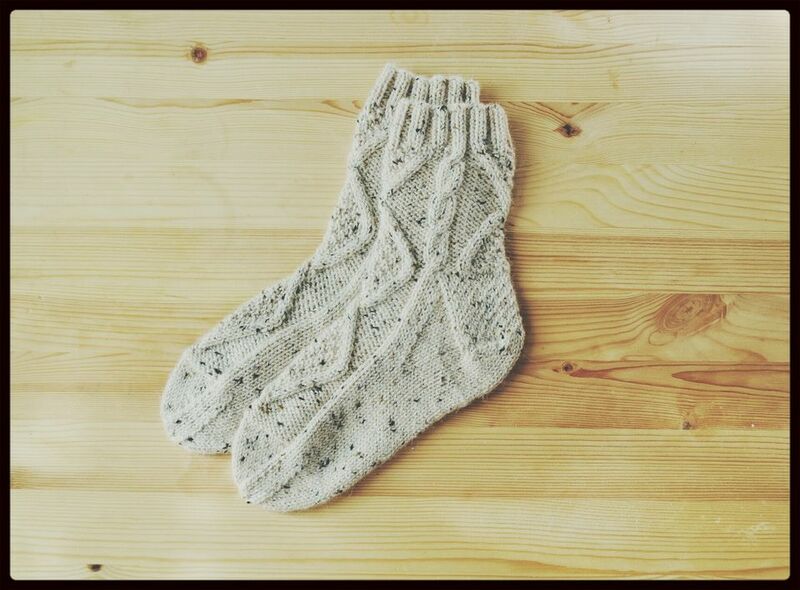 For fibers that can't be washed by machine or those of unknown origin, hand washing your knit socks is the way to go. It sounds like a bigger pain than it is; it's the same procedure you would use if you were wet blocking a knitting project. All you need is your socks, some wool wash or hand washing detergent (you can even use wool wash even on socks that aren't wool because it's delicate), a sink or bucket and two towels. Fill your sink or bucket with lukewarm water and squeeze or two (maybe a tablespoon) of your washing product. Swish it around, so the wash gets mixed in, then add your socks, pressing down on them gently, so the water and wool wash get distributed through the fibers. Let them sit in the water for 10 or 15 minutes to make sure that the fibers are thoroughly wet. Drain the water, press a little of the water out of the socks and rinse. Gently press what water you can out of the socks again, then put them on a towel. Roll the towel up and press as much water as you can out of the socks. Lay the socks out on another towel, or use a sweater dryer, and allow them to dry thoroughly. You can also use sock blockers if you like to ensure that the socks maintain their shape. Wash socks after every wear because feet can be gross! It doesn't take a lot of hands-on time to do it, so there's no reason not to, and socks usually dry a lot more quickly than sweaters do.